Prior to Fat Tuesday, here's an interesting tidbit for you to ponder ..... did you know that the official colors of Lambda Chi Alpha and Mardi Gras in New Orleans are EXACTLY the same ..... purple, green, and gold. Coincidence ?? Mardi Gras' colors were established along with the King of the Mardi Gras Carnival in 1872, and their meaning was revealed in the 1892 parade themed The Symbolism of the Colors..... purple for justice, green for faith, and gold for power. 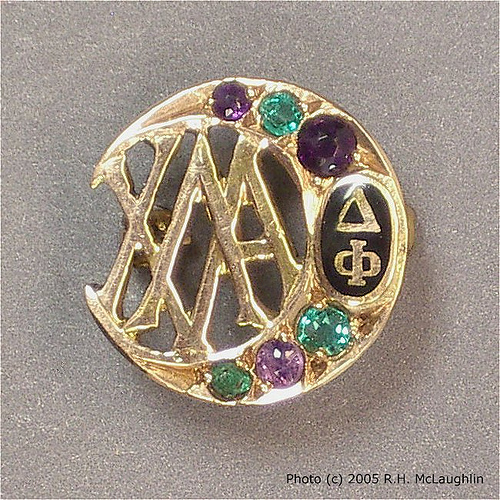 Lambda Chi's first historical reference to its colors was in 1912, when members from the chapter at University of Pennsylvania requested a jeweled badge, as was the custom with other groups on campus. On a gold badge, purple represented grapes, and green represented an olive branch. There is absolutely NO TRUTH to the rumor that the grapes represented the amount of wine consumed at a series of frat parties at UPenn that year, nor does the green represent MARTINI olives ..... rumors that were totally denied by all involved (so the legend goes .....). Makes you wonder, though, doesn't it ?? 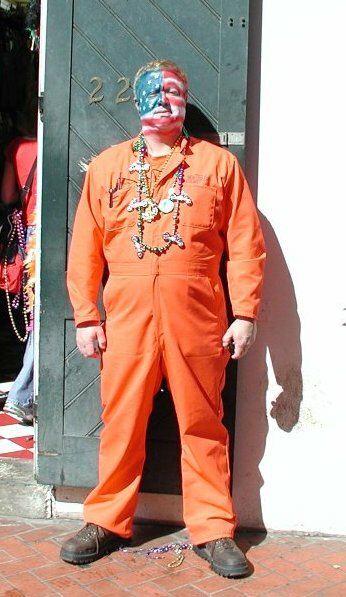 One thing you should NOT wonder about is if you see the man in the photo at left wandering around Bourbon Street or anywhere else in the French Quarter during Mardi Gras, either throw him some beads or buy him a beer ..... Old Bro Mike LaCroix (EpSig 675) sent me a note last week to let us know he is currently in New Orleans attending his 24th Mardi Gras celebration. Ah yes, a week of drunken debauchery, very little sleep, dressing in costume, beautiful ladies baring their breasts for trinkets, parading through the streets with noisemakers ..... sounds like just about any Rush Week during the mid-70's !! Let's keep our fingers crossed that Old Bro LaCroix returns safe and sound from this year's festivities, and is able to continue enjoying his annual visits to Mardi Gras for many years to come ! !